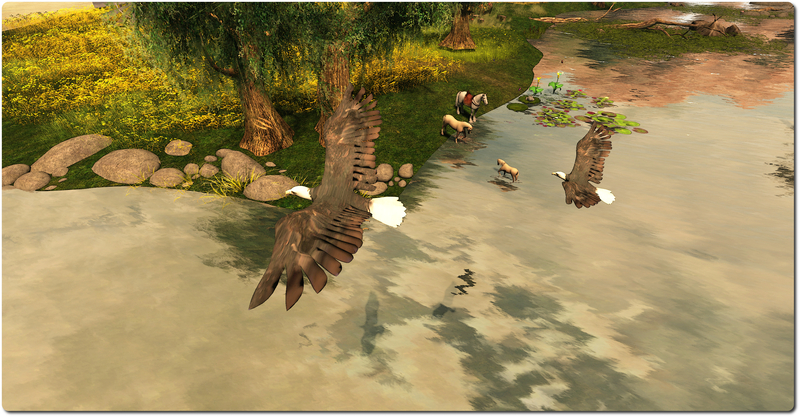 Matoluta Sanctuary is a newly opened role-play region with a difference. Offering people the opportunity to engage in equine role-play (i.e. actually taking on a horse avatar), the focus of the region and the community behind it is to raise awareness of the plight of the Colonial Spanish Horse on the North American continent. These horses, perhaps more familiarly known as Spanish Mustang by some although there are in fact several strains and sub-strains, are descendants of the original Iberian horse stock brought to America from Spain, and are one of only a very few genetically unique horse breeds worldwide. As with other breeds of horses introduced to the North American continent from Europe, some Colonial Spanish horses escaped into the wild, where, due to their nature and abilities, they became the preferred mount of the Great Plains tribes of native Americans. In more recent times their numbers have greatly reduced, and the breed’s extinction status is regarded as critical. The arrival area in the region in located overhead. Here you can obtain visitor information on the sanctuary, and background on the herd itself – which is modelled on a genuine herd of Colonial Spanish horses in Oklahoma. You can also join the Sanctuary’s access group here. The fee is L$250 to join – and is required for access to the region below (although there will be free access periods – check the calendar on the Matoluta Sanctuary website). Rezzing rights on the region cost L$500, and all fees go directly towards the upkeep of the region, events, etc. Note, as well, that visitor access is restricted to 10:00-20:00 Mondays-Saturdays; casual visitors arriving outside of these hours will be deposited at a corner tile on the region and will not be able to proceed further. From 20:00 through 10:00, access to the region is for members of the roleplay group and bloggers / photographers only. The latter can apply for special access by e-mailing matolutasanctuary@gmail.com with their credentials and then apparently going through an interview process. I’m not entirely sure how this works, as I e-mailed, but have yet to actually hear anything in reply, so am just quoting the information note card. 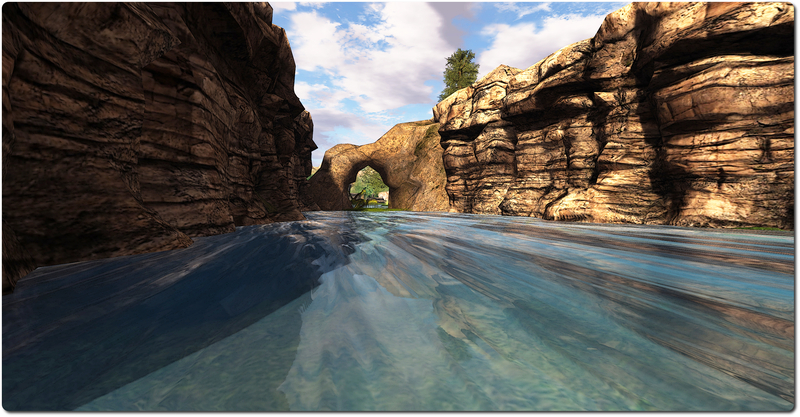 A teleport disc takes visitors down to ground level, and to one end of a watery canyon. Follow this down under the rocky arch and you’ll come to the sanctuary proper. Here a river flows outwards from distant falls and splits the land in two. On the left lays the open lands of what had been the Haskell Ranch, lost to a tornado in the 1900s, and now with only the broken remains of a windmill standing in memory of its passing. Across the water sits The Dark Glen, a place of tall trees and long grass, where many of the herd can be found. 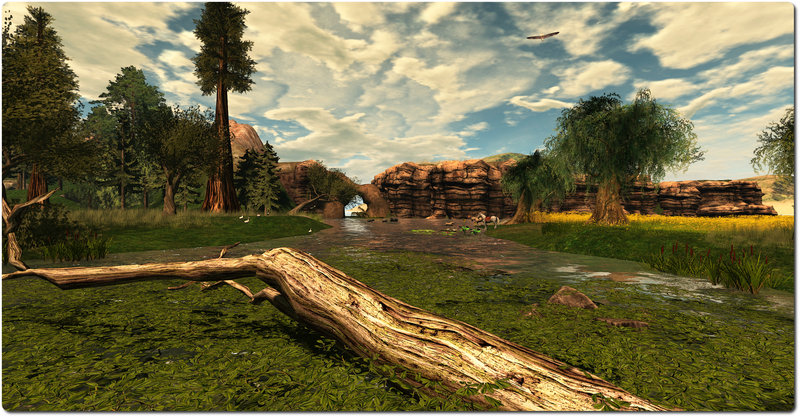 The entire landscape has been designed by Mz Marville and, together with the sim surround, is somewhat evocative of the old American West, and is very photogenic. 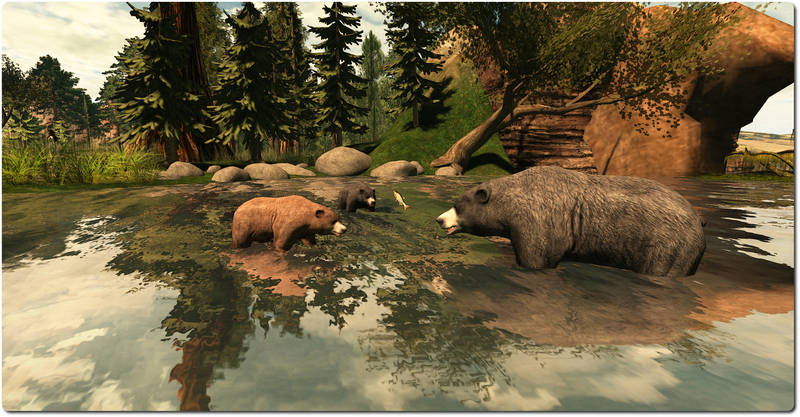 Wildlife is very much in evidence here: bears hunt fish in the river, eagles soar over the rocky outcrops, geese occupy a section of one river bank, while further inland sheep and deer can be found, as can, for the keen-eyed, badgers and beavers. And, of course, there may well be members of the herd roaming the landscape. Those interested in joining the herd for role-play can do so by contacting Ursus Broono (also known as Manatou, the herd leader). When on-line, he can often be found up on the rocks overlooking the falls, near Badger’s Gap. There’s apparently a fair degree of etiquette involved in the role-play, so a chat with him beforehand by the curious might well be in order. Role-play on the region is entirely optional for visitors, although they are encouraged to join-in with the spirit of things if members of the herd are present. 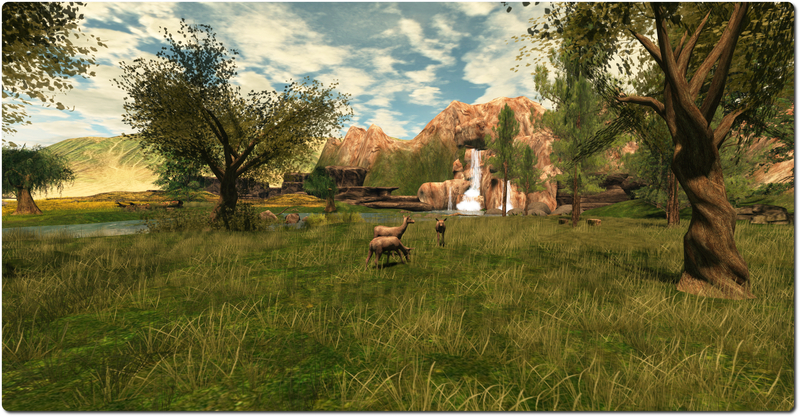 The welcome package includes a role-play attachment, and any animals visiting the region are encouraged to use the animal channels on the attachment for discrete chat. This is an interesting concept in role-play and conservationism, and further information and news on activities and events can be found on the Sanctuary’s website, which also has information on a special photography contest being run to mark the opening of the region.